I've been down with a bug (the viral, DNA-based one that puts you down in bed for days) for almost a week. Today I am finally up from that one and I decided to not strain the brain with anything brainy so I fired up MS Flight Simulator X and got a couple of flights on VRS's Superbug. Not a good idea for a severe cold hangover. 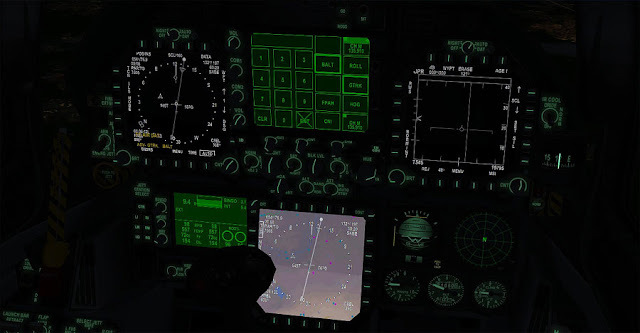 :) This add-on for Flight Simulator is highly detailed and took me quite a while to put my flying act together. 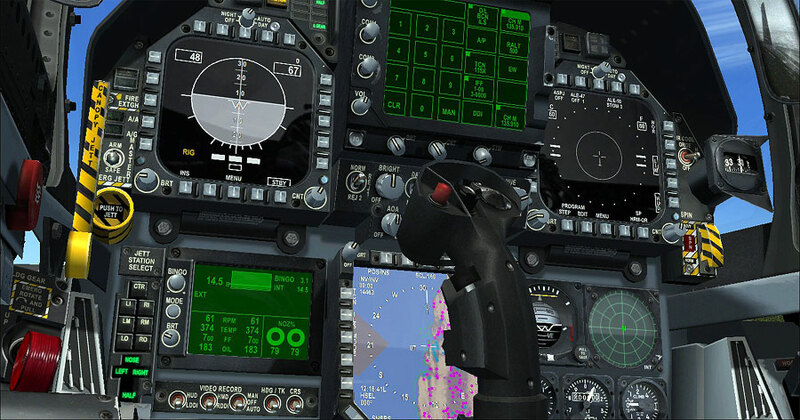 With detailed avionics and an authentic fly by wire flight model, this add on is not for the faint of heart. 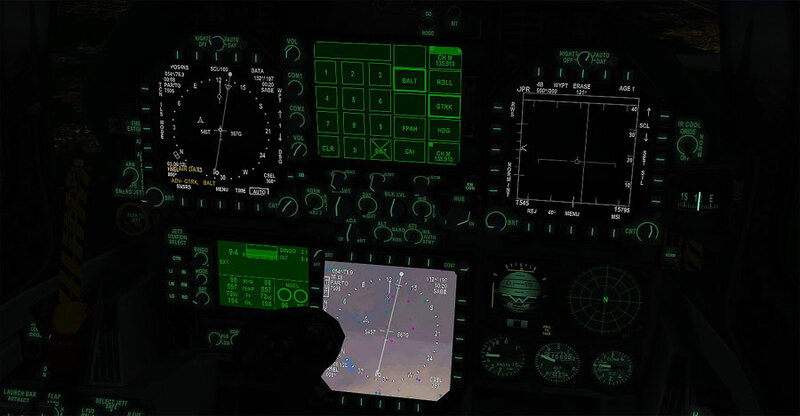 Even getting the add-on to work in Flight Simulator X is a bit disorienting for the casual user like me. The office. More than 90% of those buttons are clickeable. But all my eternal FSX newbie bitching aside, here are some very good news: VRS will be releasing an add-on to this aircraft that will allow combat air operations! It's on beta testing right now and will be coming out soon, I heard. Oh yeah! Nothing goes better with cold medication than night flights. Somewhere in the West Coast, USA. An extremely rough landing in Jorge Newbery Airport (AKA "Aeroparque"). Buenos Aires, Argentina. I'm just a couple of hundred meters from the best steak in the world. MS FSX is a civil aviation flight simulation. Do you think that it can successfully be converted into a combat flight simulator? 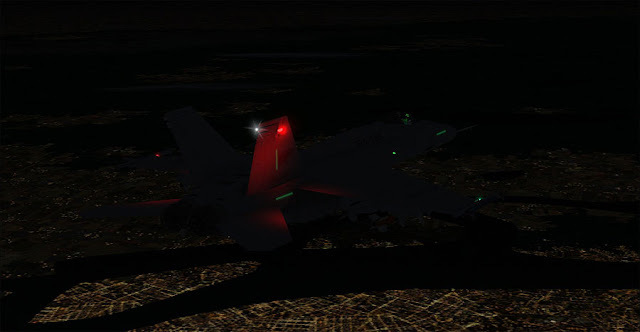 Dunno Man perhaps there's not too much interest from developers to turn FSX into a combat flight sim, but I hope that they keep working on this game since it's way better than the latest "free" one from Microsoft. I would like to ask you a question about 2 Wargames and I do it here since I'm sure that you will read these reply. I would like to buy either "Steam and Iron- The Great War at Sea" or "Jutland" from Storm Eagle. This latter seems really fascinating with good graphic too, but since I don't care much for graphic and I have quiet an old PC I wondered if you can give me an advice on which one of the 2 to buy (I can't at the moment afford both).... Thank you so much if you can help me. Both great games in their own. Jutland is all about tactics at short (in WWI naval scale, off course) range. The computer opponent knows the general direction of your ships, so the pre-engagement maneuvers are made with your opponent have no fog of war. That said, the "short range" tactical part is very good. And off course is 3D. There is a demo available at their website, make sure to try it to see if your computer can handle it (I'm sure it will). Ah! The DRM is kinda of too much: you need to run the game using a client software which is like the ugly sister of Steam. You can play offline, though. Steam and Iron is a beauty in its simplicity, ease of play and (if you want it so) quick resolution. It also allows you to pre-maneuver your ships well hidden from the enemy. That cat and mouse thing is greatly done. If you are into 20th century naval warfare, I am sure you will get both at certain point.